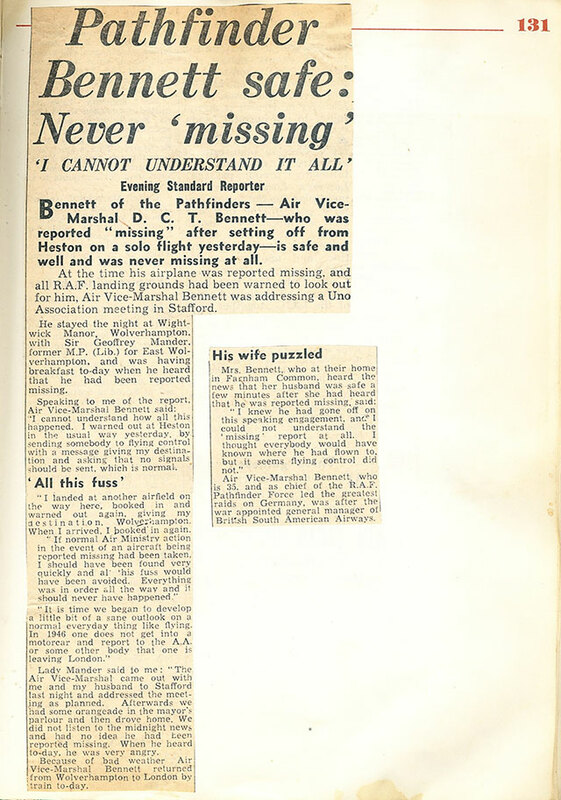 Bennett of the Pathfinders – Air Vice Marshal DCT Bennett – who was reported “missing” after setting off from Heston on a solo flight yesterday – is safe and well and was never missing at all. 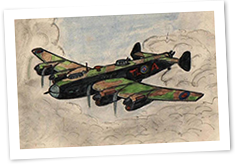 At the time his airplane was reported missing and all RAF landing grounds had been warned to look out for him. Air Vice-Marshal Bennett was addressing a Uno Association meeting in Stafford. He stayed the night at Wightwick Manor, Wolverhampton, with Sir Geoffrey Mander, former MP (Lib) for East Wolverhampton and was having breakfast today when he heard that he had been reported missing. Speaking to me of the report, Air Vice Marshal Bennett said: “I cannot understand how all this happened. I warned out at Heston in the usual way yesterday, by sending somebody to flying control with a message giving my destination and asking that no signals should be sent, which is normal. I landed at another airfield on the way here, booked in and warned out again, giving my destination, Wolverhampton. When I arrived, I booked in again. If normal Air Ministry action in the event of an aircraft being reported missing had been taken, I should have been found very quickly and all this fuss would have been avoided. Everything was in order all the way and it should never have happened. It is time we began to develop a little bit of a sane outlook on a normal everyday thing like flying. In 1946 one does not get into a motorcar and report to the AA or some other body that one is leaving London. Lady Mander said to me, The Air Vice Marshal came out with me and my husband to Stafford last night and addressed the meeting as planned. Afterwards we had some orangeade in the Mayor’s parlour and them drove home. We did not listen to the midnight news and had no idea he had been reported missing, When we heard today, he was very angry. Because of bad weather Air Vice Marshal Bennett returned from Wolverhampton to London by train today. Mrs Bennett, who at their home in Farnham Common heard the news that her husband was safe a few minutes after she had heard that he was reported missing, said: I knew he had gone off on this speaking engagement, and I could not understand the ‘missing’ report at all. I thought everybody would have known where he had flown to, but it seems flying control did not. 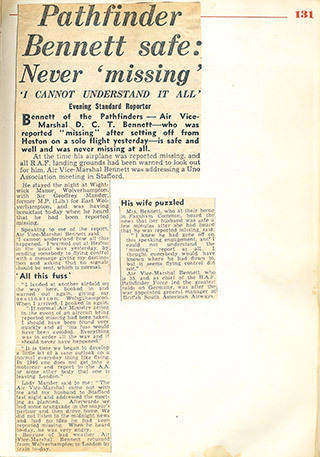 Air Vice Marshal Bennett who is 35 and is Vice Chief of the RAF Pathfinders Force led the greatest raids on Germany, was after the war appointed General Manager of British South American Airways.